Everybody loves a quitter. OK, that’s not how the saying goes, but when someone chooses to leave a job, it can be an encouraging sign for the economy. Employees who quit of their own volition usually are moving to another – presumably better – position, or they’re confident that either they can get by without a job or land a new one if they need to. Part of the multitude of data tracked by the federal Bureau of Labor Statistics is the Job Openings and Labor Turnover survey gathered monthly since late 2000. These reports indicate employers’ demand for workers in terms of openings, hires and separations. The surveys involve more than 16,000 workplaces. Separations include workers the employers terminate by layoff or firing as well as employees who quit on their own. Layoffs gauge how employers view the economy – increasing in times of slow business and high costs and dropping off again as places need to keep and even add workers. Quits tend to reflect how employees feel about their chances beyond their current situations. The latest JOLTS, as labor aficionados call the report, shows that more than 2.2 million Americans quit their jobs in April, up 7.2% from March and back to the level of four and a half years ago, during the Great Recession and at the beginning of the financial collapse. Still far from the 3.3 million quits registered just before the 2001 recession, the U.S. employment picture is improving. 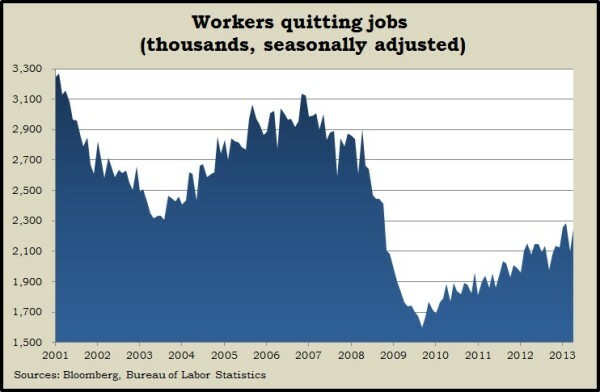 A low of 1.6 million workers quit in the fall of 2009. 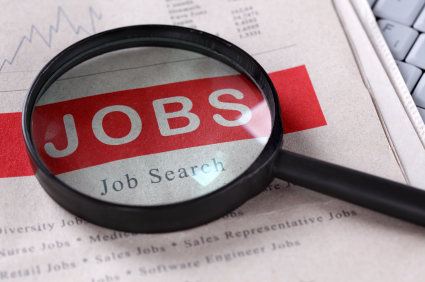 Though measured separately from the widely publicized monthly employment reports, the rising number of quits could temporarily push up the unemployment rate as more job seekers are between positions. But knowing that more workers feel confident about the job market can also be part of a broader gain in consumer sentiment, considered a leading indicator of consumer spending, which accounts for 70% of gross domestic product. By that logic, the more Americans quit their jobs, the more the economy prospers, which helps generate the revenue that corporations need to maintain the earnings that investors rely on for stock appreciation and dividends.